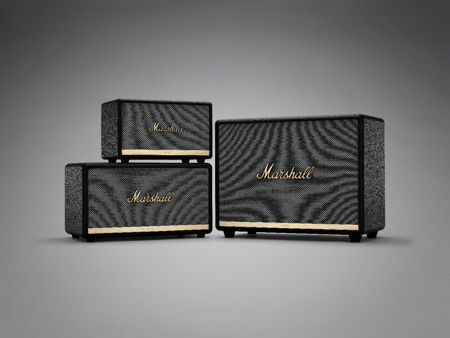 If you are in the market for a Bluetooth speaker that not only looks good, but sounds great as well, then the folks over at Marshall have just the thing for you. In fact, their latest range of speakers comprise of a trio of models: the Acton II Bluetooth, the Stanmore II Bluetooth and the Woburn II Bluetooth. Each of these speakers will merge advanced components including class D amplifiers, a bass reflex cabinet system as well as custom-tuned drivers that have been specially engineered to deliver a balanced and dynamic audio response. Regardless of which particular model you choose, all of them will arrive equipped with an upgraded DSP, in addition to an improved dynamic range compression. As a result, you will end up with optimal performance regardless of the volume level that you are accustomed to. Feel free to play back your favorite tunes as loud as you want to, without having to compromise on the acoustic characteristics. All of them will also feature Bluetooth 5.0 connectivity, enabling them to deliver a wireless range of up to 30 feet (10 metres). Apart from that, each speaker will also feature multi-host functionality, enabling the listener to hook up easily and switch between two Bluetooth devices without missing a beat. Marshall has also thrown in the Marshall Bluetooth app that lets the user customize one’s listening experience as well as control the music they’re listening to over a mobile device. The app itself can switch between EQ presets, set up stereo or ambient mode, and adjust the intensity of the LED lights that are located on the top panel, now how about that? Imagine waking up the speaker or sending it into standby mode in just a matter of seconds. The Acton II, Stanmore II and Woburn II will arrive in black and white colorways, with an asking price of $249, $349 and $499, respectively for those who are interested.